Be the first to share your favorite memory, photo or story of James K.. This memorial page is dedicated for family, friends and future generations to celebrate the life of their loved one. 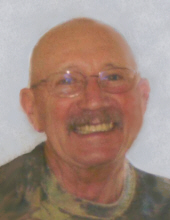 JAMES K. “POSTIE” LARSON, 76, of Morrison, IL, died Tuesday, February 5, 2019 at Glen Elston Nursing and Rehabilitation Center in Chicago, IL. Cremation rites have been accorded. There will be no visitation or funeral service. Interment will be in Oak Knoll Memorial Park in Sterling, IL. The Morrison Chapel of the Bosma-Renkes Funeral Home is in charge of arrangements. Jim was born January 23, 1943, in Morrison, IL to Kenneth T. and Verna (Radatz) Larson. He was educated in the rural Whiteside County grade schools and was a graduate of Morrison High School. He was a veteran of the United State Navy. On October 10, 1998 he married Barbara L. Matthiesen in Clinton, IA. Jim was employed by General Electric of Morrison for 35 years, retiring in 2000. He had served as a volunteer firefighter for the Morrison Fire Department and he was a member of the Morrison Country Club. Survivors include his wife, Barb; one step daughter, Melissa (Darron Evans) Regenwether of Clinton, IA; two step sons, Marc (Lori) Regenwether of DeWitt, IA and Mike (Tracey) Regenwether of Clinton, IA; thirteen step grandchildren; one step great grandchild; two sisters, Mrs. Esther Hook of Wenona, IL and Mrs. Marjory Mulnix of Wentzville, MO. He was preceded in death by his parents; two brothers-in-law, Ersel Mulnix and Dan Hook; three nephews. To send flowers or a remembrance gift to the family of James K. "Postie" Larson, please visit our Tribute Store. "Email Address" would like to share the life celebration of James K. "Postie" Larson. Click on the "link" to go to share a favorite memory or leave a condolence message for the family.